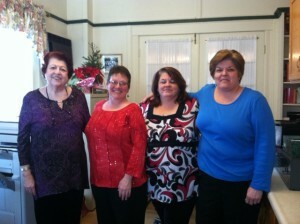 Parish staff and volunteers: Linda, Judy, Kerri and Ann. The parish will provide an annual record of contributions consisting of cash and checks, given through the budget envelope system. For any special contributions given to the church without using the envelope system, an official receipt of contribution will be provided upon request. Please call Kerri Caduto at 401-568-5600 between 8:00 a.m. to 12 noon to order envelopes or if you have any questions.